For video editing lovers, a good processor and graphics like Intel core i7 and NVIDIA graphics is necessary. Here we found 10 best laptop for video and movie editing with maximum specs from wiknix.com. With these video editing laptop, you can edit your videos freely with the editing functions. In fact, you can also download some popular NLEs like Avid Media Composer, Adobe Premiere Pro CC, Premiere Pro CS6/5/4/3, Adobe After Effects CC, After Effects CS6, Adobe Premiere Elements 13/12, Pinnacle Studio, Windows Movie Maker, Sony Vegas Pro 13 Edit, Sony Vegas Pro 13, Sony Vegas Pro 13 Suite, Sony Movie Studio 13, Sony Movie Studio 13 Platinum, Sony Movie Studio 13 Suite etc. Don't worry the format/codec compatibility problems, just get iFastime Video Converter Ultimate to solve there related problems. It can convert any videos from camera/website etc like MP4, FLV, MOV, MXF, H.265, MKV, AVI, MPEG, etc to NLEs supported formats and any formats you want quickly. What's more, with it you can watch any 3D movies at Laptop perfectly by converting movies to 3D movies. iFastime Video Converter Ultimates primary function is converting video files from one format to another, which it does quite well. However, that's not the whole story: This video converter software application also allows its users to download, watch, transfer, edit and create all types of video files from nearly any source. Once you have the video you want to convert loaded into the interface, all you need to do is select one of the program's conversion profiles. These profiles run the gamut from simple format swaps to optimization profiles for specific devices such as smartphones, tablets, gaming systems, televisions, set-top boxes and more. You'll find over 150 such profiles. And it won't take you long to find a profile that fits the device you own. Most of the video converters on our side-by-side comparison chart can take up to 65 minutes to convert an hour-long video. And even then, the results are questionable. iFastime is able to perform the task in five minutes or less. Only two programs in our lineup were able to beat that time. And even then, they only did it marginally faster. We found Video Converter Ultimate to be extremely easy to use. Everything is clearly labeled and easily accessible. It is set up so that most tools only involve pointing and clicking to reach your destination. We didn't have any problems understanding the process and were able to jump right into converting video files within minutes of downloading the software. As you might expect from this Gold Award Winner, the quality of the converted video is all but identical to the original. Our video experts were hard pressed to find any flaws in the picture or audio of the converted file. In short, unless you have superhuman vision or hearing, there's no reason to worry about any quality loss when converting videos with iFastime Video Converter Ultimate. When you're converting a motion picture or television show, this program gives you the option to fetch its metadata from the internet. All you have to do is open the information tab for the video you want to convert, type in the name of the show and the program will search the internet for the associated data. Things, like the name of the director, writer cinematographer, cast and info, are automatically inserted it into your video before the conversion begins. This means that a player can treat the converted file as though it were the original – cover art and all. One of the more unique aspects of iFastime Video Converter Ultimate is its ability to transfer videos wirelessly. This application lets you move a video file from your computer to a mobile device, such as a smartphone or tablet, over a Wi-Fi connection. This feature, while having little to do with converting files, is incredibly convenient. However, it doesn't stop at mobile devices: This program has the ability to connect with a compatible television, set-top box or gaming system and wirelessly stream your converted videos to your TV without any manual transfer. This is a great convenience for users who are on the cutting edge of entertainment technology. Another great feature found in iFastime Video Converter Ultimate is its video editor. While iFastime offers a full-featured editor as a separate application, it has included some of the basic editing tools for their converter application. This application gives you the ability to trim clips, adjust qualities, such as contrast and brightness, as well as add watermarks and subtitles to your videos. These tools provide exactly what you expect from a conversion. 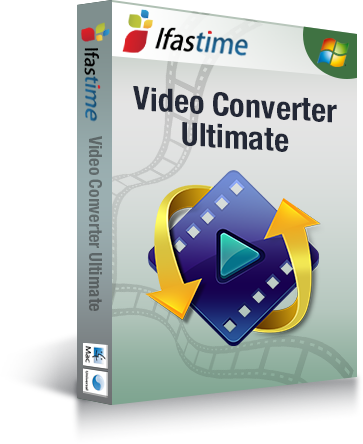 iFastime Video Converter Ultimate provides solid support for its customers, most of which we don't think you will need because it is a very intuitive application. If you need to ask a question, there is email support, an in-application guide, FAQs, live chat and user forums at your disposal. We found that the forums contain a lot of helpful user-contributed information. We received responses to our emails within a day. The live-chat coverage could be spotty at times, but that is fairly common. is able to perform the task in five minutes or less. Only two programs in our lineup were able to beat that time. And even then, they only did it marginally faster. We found that the forums contain a lot of helpful user-contributed information. We received responses to our emails within a day. The live-chat coverage could be spotty at times, but that is fairly common. How to Play AVI on iPhone 7/SE/6s Plus/6s Successfully?